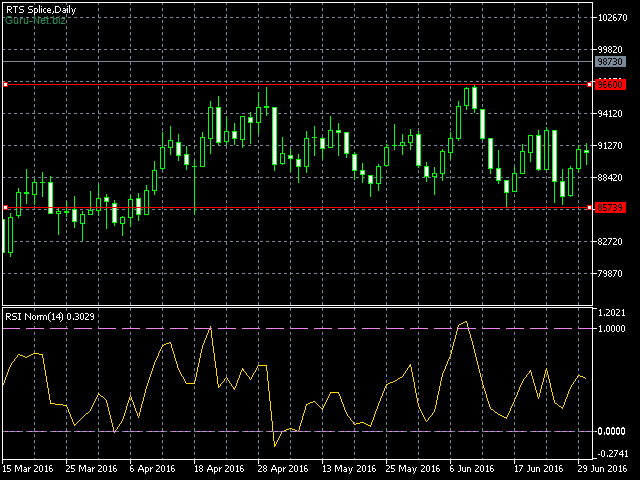 Oscillator normal BBands is a set of oscillators normalized using Bollinger Bands. The screenshot 1 contains the intraday chart of the RTS index futures contract with RSI indicator. This seems to be a perfect chart for an oscillator-based trading system. The flat movement with the range of 12 000 points lasts for four months. However, there are no market entry signals, since the indicator readings do not reach the overbought/oversold levels having the standard values of 30 and 70. Of course, you can change the level values, for example, to 40 and 60. But if a movement starts on the market, such setting causes an increase in the number of false signals. The possible solution is normalizing the indicator readings using Bollinger Bands. According to statistics, 95.4% of the price values should fall within the channel consisting of the two standard deviations. Thus, the indicator shows an extreme deviation from the average price and is not bound to its absolute value. Since we are interested in an extreme deviation from the average value of the indicator (as this may indicate a possible market reversal point) rather than the absolute value, we use Bollinger Bands to normalize the oscillator readings. New oversold/overbought level values are equal to 0 and 1. They do not require selection of numerical values greatly simplifying trading system optimization. 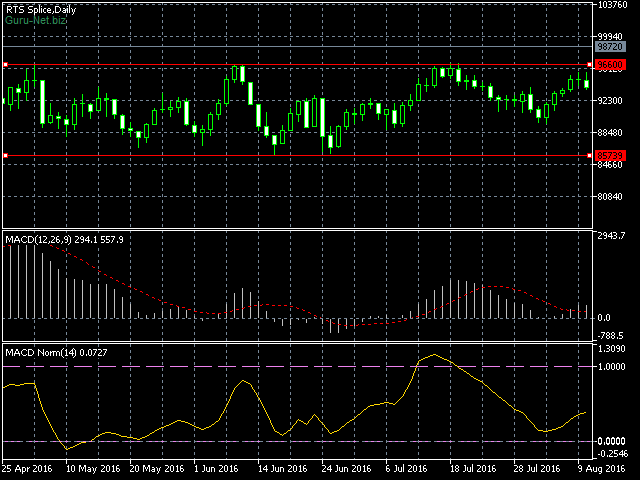 Some indicators, including popular MACD, have no overbought/oversold levels at all making them difficult to use. However, normalizing the indicator readings using Bollinger Bands allows you to receive these levels as shown on the screenshot 3.
period oscillator - oscillator period for normalizing, default is 14.
period Bollinger Bands - Bollinger Bands period used in normalizing, default is 20.
deviation Bollinger Bands - deviation for Bollinger Bands, default is 2.